Big fun for little people. Adventures for children and families, so no-one's cooped up inside this winter! Deaking University Honorary research fellow Dr Pete Gill is the CEO of the Blue Whale Study, Australia’s longest-running blue whale research program, based near Portland. Hear Dr Pete’s fascinating insights on the largest living creatures on earth, the endangered blue whale. Learn about their ecology, migration, habitat and behavior. This event is part of the Winter Whale Trail from Cape Otway to Cape Nelson. Mandy Watson, senior biodiversity officer with the Department of Land, Water, Environment and Planning, presents a talk on the majestic Southern Right Whales, who journey each winter to our coastline to give birth. Join Mandy for an update on the nursing mothers and calves who visit our local waters every year. This event is part of the Winter Whale Trail from Cape Otway to Cape Nelson. Your ticket includes a guided tour and free return bus, departing at 10am from Port Fairy Visitor Information Centre. Bookings advised - these tours sold out last year! Phone 0458 999 315. Become a family of beach detectives! Investigate the articles that wash up and search for seaweed, shells, crabs and other interesting and sometimes unexpected specimens we happen to find. Once we bag the treasures we’ll work out what they are, where they’ve come from and what they might be doing. Wear warm clothes, bring a magnifying glass (if you have one) and small bucket. All families will receive a copy of the booklet A Year on South Beach. These classes are designed by Donella for little bodies and minds to enjoy a special session of asanas, yoga nidra (relaxation), pranayama (breathing) and meditation. A safe, fun and authentic way for children to explore yoga in a beautiful riverside setting. Wear comfortable clothing and bring your water bottle. Can you find the magic in town? Head to the Visitor Info Centre to begin the search for fancy, friendly fairies. Collect your clues and look carefully, high and low, in unexpected places. Fairies like to stay hidden, after all! This new event is proudly sponsored by Juno Boutique. A beautiful riverside gathering to close out the festival! With mulled wine and hot chocolate, DJ, hot food and fire drums – just BYO marshmallows. Check out the last night of lights on the Moyne River and draw with light - it's so cool! And you have an extra special chance to take a peek in the new wharf building!! It will be open for you to wander through and see the Strange Garden growing inside. Event is weather permitting, check at the Visitor Info Centre or the festival website on the day. This event is proudly sponsored by Ashmont Motor Inn & Apartments. Join the fun of the opening night with live music, mulled wine, hot chocolate and tasty treats as we launch our beautiful festival! See the giant projections in the centre of town to begin your own tour of the Bathed In Light illuminations dotted all over Port Fairy. An evening to gather and glow in our crisp winter weather. This event is proudly sponsored by Evolve + Pash clothing and homewares. The Men’s Shed masters lead a toy making workshop for kids of all ages to construct wooden toys. All materials and equipment is provided in this hands-on open class, where children can paint their toy after building it. After a session on the tools, wander through our excellent community market for local and handmade produce and treats. Get your dancing shoes off, and your bathers on, for this flashy, splashy disco, complete with a live DJ and laser light show, games and more. 15 years and under. No drop-offs, parental supervision is required. Fundraiser event for the Belfast Aquatic Community Pool. Calling all kids under 13, it’s the school holidays – time to party hard at the Little Thunders Disco! There’ll be an aerial hoop demo and everyone’s invited to try it themselves! Plus, dance competitions with prizes, laser lighting, smoke machines, DJ, hot food and drinks. Tickets at the door. Engage your senses and bare feet! Join us for a winter’s afternoon full of creative nature play and flow. Children and parents are welcome. Wrap up in warm clothes and bring your own water bottle and snacks. Sorry! This event is sold out. Enquiries via their Facebook page or pop into the café. Sunday 8 July 10-2pm. Meet at Port Fairy Visitor Information Centre at 9.30 if you'd like to follow cars to the reserv. Join the Friends of Pallisters Reserve at their 250-hectare wetland space, home to more than 125 bird species and hundreds more flora specimens including gums, tea trees, banksia, rare native grasses and more than 25 orchid varieties. Youngsters can make seed bombs with native species, then go for a seed-bombing mission! Photograph wildlife and assist in recording specific types of fungus. Enjoy a tasty BBQ and discussion of the reserve’s past, present and future works. There’s plenty of shelter too in their headquarters. All welcome. Wear full-cover clothing and shoes. Hear stories from local photographer Perry Cho, whose captivating pics of the Southern Ocean and its marine life are well known in these parts. Meet Perry and learn about camera techniques for capturing the world’s largest animals along our coastline. This event is part of the Winter Whale Trail from Cape Otway to Cape Nelson. Photo of humpback whale by Perry Cho. Head back to school for the annual evening market presented by the primary school community. This is a warming blend of local handmade products, food, drinks and live entertainment. Fundraiser event for Port Fairy Consolidated School. Animated light painting and local music join forces for an extravaganza of light and sound. Witness live illustrations riffing off live music of a top secret local musicians. All followed by Projector Bike’s multi projection walking tour, projecting short films onto the buildings of Port Fairy. Do not miss this super cool illuminated show! Work with local artist James Chapman of Boy and Dog Art to discover how street art is making a positive impact locally. Then hit the streets to create your own chalk versions on the sidewalks, walls and paths of Port Fairy. For ages 7-18, wear warm clothes and bring a water bottle. Light snacks provided. New event! Proudly sponsored by Jan’s Fine Glass. Walk with the Friends of Griffiths Island and hear info and insights about wildlife and environmental changes occurring on the island in the colder seasons. You’ll also be treated to a small-group tour of the lighthouse to spend time inside the tower, learning about life as a colonial settler. 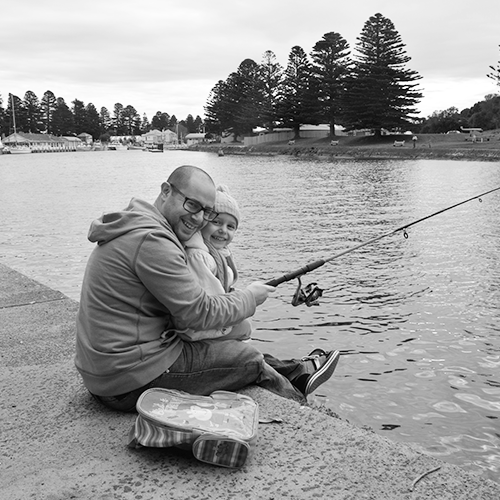 Cast your rod on the mighty Moyne and learn from the Port Fairy Angling Club experts. Rods and bait supplied. A fundraiser for the Port Fairy Angling Club. Please note: this event is subject to weather - check with the Tourist Info Centre on the day. Port Fairy Theatre Group presents seven plays. The stage will come alive with this entirely local collection of plays and performance! In its 3rd year, the Short Play Festival showcases the talent of our local writers, directors and actors. New productions! You’ll find no Cinderellas or happy-ever-afters here! Instead, gather round the fire and let long ago tales sweep you into a world of witches and curses, warrior girls and clever boys who battle odds and win (mostly). An event for all ages, children must be accompanied by an adult. Food and drink available in Captain Wishart’s garden. New event! Proudly sponsored by Port Fairy Confectionary Lolly Shop. Meet journalist, writer, TV presenter and Aussie Rules fanatic Samantha Lane at this special event celebrating women’s and girls’ football in the South West. The author joins passionate local women’s footy coach and ambassador Alicia Drew for a conversation on the rise of women’s football, the nuances in the game and the hugely successful formation of the national women’s league. Hear about Lane’s rousing new book Roar: stories of the strength, skill and determination of some of AFLW’s most exciting stars. An inspiring event for all.